Argentina striker Sergio Aguero has been named in the PFA Premier League Team of the Season for the first time in his career. The 29 year old is one of five players from champions Man City to feature in the XI- Nicolas Otamendi, Kyle Walker, Kevin de Bruyne and David Silva are the other four. Tottenham Hotspur have three representatives in this ToTY 17/18 in the form of Jan Vertonghen, Christian Eriksen and Harry Kane. 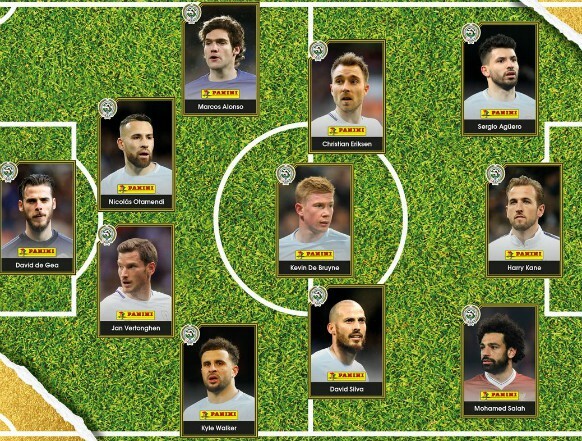 Chelsea, Manchester United and Liverpool are represented by one player each in the form of Marcos Alonso, David de Gea and Mo Salah respectively, which means the XI contains no player from outside the top six. De Gea, Walker and Kane are the only three who were present in the 2016/17 Team of the Year too. De Gea has now been present in the ToTY 5 times, Kane 4 times, Walker 3 times, Vertonghen and David Silva 2 times. All the other entrants in the 2018 ToTY list have been named for the first time in their PL careers. Would’ve probably also gone for Davies or maybe even Robertson ahead of Alonso.